Today's mail contained an envelope with a bulky item in it. It was from "Mary Maxim". I scratched my head...what could it be? I've never heard of the company before and I thought it was a gag gift. 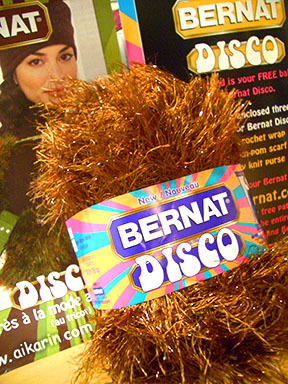 The packaged actually contained my free sample of Bernat's Disco yarn; a whole skein in a coppery brown color called "Mr. Brown". Click on the thumbnail for a closer look at "Mr. Brown", LOL! I actually like the color. It's very sparkly & fun. ^_^ My camera didn't capture the sparkliness well. The texture is not slick...it's soft, but has a little bit of a "crunch"
I also went through my collection & added a few more ponies to the "extras" section. Give me a few minutes to link the pics. To the left is a pony named "Princess Broccoli". She will have tinsel & crazy curls & a 3-D chunk of Broccoli as her symbol. The pony on the right is "Remembrance". Her symbol is a field of orange-red poppies on both sides. She was re-rooted with a new type of hair that is like Silky Kanekalon. I just need to style her hair & take some pics. The Borg pony is coming along beautifully, if I could say that. ^_^ I'll be painting her body mostly black. The "window" in her side will be covered with aluminum mesh. you should like weddings their cool have you been to one. Love the colour on both of the new customs in progress. And, well, the Borg pony. Yes. It's a Borg pony. Who can resist a Borg pony? Yes, the Disco is really interesting and sparkly. I wish you could see it in real life. Remembrance looks gorgeous! Borg pony looks like a really fun project too/ What are the wires sticking out of the neck for? Thanks for the comments! The wires go to the LED in it's head. They won't be visible when the pony is put together. The battery pack is in the body. Wait, so we'll get to see inside the pony as well? Will you be decorating the inside with extraneous wires and paint? Or leave it blue? But wire mesh over a 'window' --that's a neat idea. I don't think you'll be able to see much of the inside...it'll be too dark. I could add some wires behind the mesh, though. I'm not painting the inside. And... is she a Twinkle Eye? LOL, I thought I was the only person who loved broccoli! It was a random idea I sketched out before I went to bed one night. She's going to have sparkly eyes, but she's not a TE. If you can't find the flutter, post her description & I'll try to help you with it.